The temple, at this particular time, becomes an earthly heaven; those who officiate represent Christ Himself, the Angels, the Cherubim, Seraphim and Apostles. The Liturgy is the continually repeated solemnization of God’s love to mankind, and of His all-powerful mediation for the salvation of the whole world, and of every member separately: the marriage of the Lamb—the marriage of the King’s Son, in which the bride of the Son of God is—every faithful soul; and the Giver of the bride—the Holy Spirit. With what prepared, pure, elevated souls it is therefore necessary to assist at the Liturgy, in order not to be amongst the number of those who, having no wedding garment, but a garment defiled by passions, were bound hand and foot, and cast out from the marriage feast into utter darkness. Whilst now, unfortunately, many do not even consider it necessary to assist at the Liturgy at all; others only go out of habit, and go away in the same state of mind as they came, without elevated thoughts, without a contrite heart, with an unrepentant soul, without the determination to amend. Some stand in church irreverently, inattentively, without any concentration of mind, without any previous self-preparation at home by means of meditation and abstinence; and many manage to drink and eat more than they should before service. When the Lord descended upon Mount Sinai the Hebrew people were ordered to previously prepare and cleanse themselves. In the Divine service we have not a lesser event than God’s descent upon Mount Sinai, but a greater one: here before us is the very face of God the Lawgiver. When the Lord appeared to Moses upon Mount Horeb in the bush, he was ordered to put off his shoes from his feet; but here is a greater manifestation of God than upon Horeb; there was only the prototype, here is the Typifier Himself. O, how we cling to earthly things! We do not even wish to devote one hour exclusively to God! 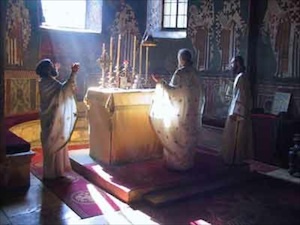 Even during the Divine, most heavenly Liturgy we allow ourselves to think and dream of earthly things, and fill our souls with images and desires for earthly things, sometimes—alas!—even with impure images; when we ought to be praying ardently, to be assiduously meditating upon this great mystery, to be repenting of our sins, longing and praying to be cleansed, sanctified, enlightened, renewed, and strengthened in the Christian life, and in the fulfillment of Christ’s commandments; when we ought to be praying for the living and dead; for the Liturgy is a sacrifice of propitiation, thanksgiving, praise, and prayer. Great is the Liturgy! In it remembrance is made, not of the life of any great man, but that of God Incarnate, Who suffered and died for us, Who rose again, ascended into heaven, and Who shall come again to judge the whole world! « Most of the Time the Earth is Flat	« Where is Heaven?